After following the excitement the past week at home in Toronto, I decided to drive the six hours to Montreal to witness the event live. I am glad I did. The atmosphere in the Theatre Maisonneuve was simply electric this evening, with an excellent house, certainly better attended than the Chant 2007 finals last year. Tonight was the second of two nights of finals, with three candidates performing. First up was Elizabeth Schumann (USA), playing Chopin piano concerto no. 1. A stylish pianist, Schumann does not possess the big technique like some of the other finalists - she wins points through elegant and poetic playing, her forte. On this particular evening, she unfortunately had an off-night. I found her playing lacked the depth of tone that one has come to expect at this level of competition. It didn't generate much excitement. The most damaging moment occured in the third movement, when a memory lapse caused her to come to a dead stop. Conductor Jean-Marie Zeitouni had to wait for her to re-start. A memory lapse can happen to any artist, but at a competitive situation, it is truly unfortunate. Incidentally, at the semi-finals, Ms. Schumann had a disastrous experience in the Schumann-Liszt Widmung. With only 90 seconds to go before the end of her program, she "got stuck" at one point and it took her five or six tries to get going again. Her uninspired performance this evening is likely something Ms. Schumann would rather forget as soon as possible. Nevertheless, the audience generously applauded her. Things picked up tremendously with the next candidate, Russian Alexandre Moutouzkine, playing the Rachmaninoff 3rd. He was everything that Schumann was not. He may not be a particularly subtle pianist, but his dazzling technique simply blows you away. Most piano aficionados would agree that Rach 3 is the Mount Everest of piano concertos, at least in terms of technical demands. Well, Mr.Moutouzkind scaled it triumphantly, as if it is childs play. He stunned the audience with his jaw-dropping, stupendous technique - the sheer power and elan of his playing has to be experienced to be believed. I have to say I had Alexandre Moutouzkine as my first prize winner up to this point. But I made up my mind too soon. The third and final candidate of the competition was Armenian pianist Nareh Arghamanyan. At 19 she is the youngest of the competitors. From the first chord on, it was clear that she was an artist to be reckoned with. She played with an equally big technique, but her playing was not just about technique - it was also about playing the music. Her involvement was total and uncompromising. You can tell she lived and breathed the moment, not just playing it with her fingers. She played as if possessed. I swear it came from her soul. Normally I am not fond of pianists with a lot of twitchy or quirky body movements, but with Ms. Arghamanyan, one immediately senses that it is all real, there is nothing phony or fake about it. It's very much part of her music making. Her playing was as poetic and it was prodigious technically. Here we have a complete artist - at 19! With such phenomenal displays of artistry from several of the candidates the two evenings, it didn't take the jury long to decide. By 10:45, the audience was called back to their seats. 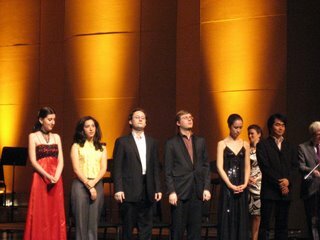 With the nine jurors seated onstage, Mr. Simon Durivage announced the winners. When he announced that the First Prize went to Ms. Arghamanyan, the hall erupted in vociferous applause. It was an entirely deserving triumph. Although I have to say I had a soft spot for Moutouzkine. I thought it might be a tie between Arghamanyan and Moutouzkine. 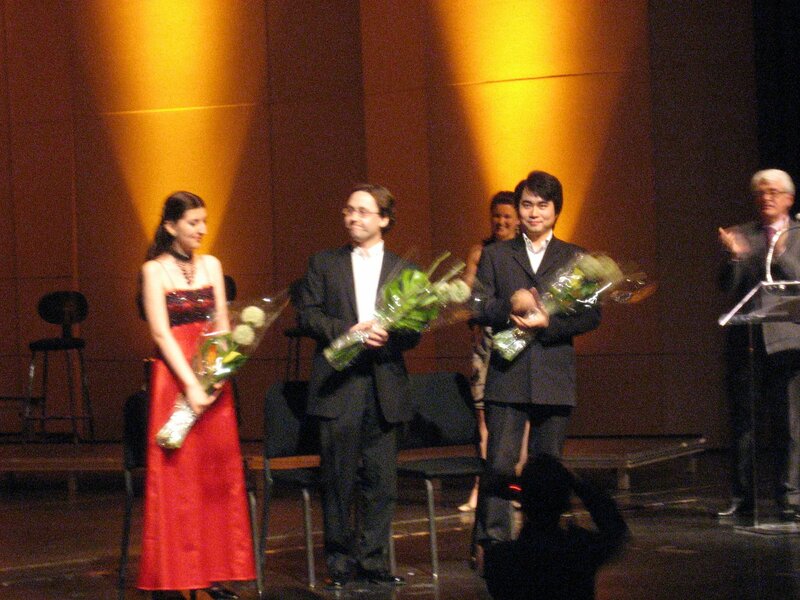 As it turned out, Moutouzkine was tied with Japanese pianist Masataka Takada in second place. No Third Prize was awarded, the prize money of which was added to that for Second Prize and divided equally for the two Second Prize winners. I am kind of sorry that Sara Daneshpour didn't make it to the winner's circle. She gave a very fine performance last evening, but then the Japanese Takada was equally deserving, and perhaps just that much better. Canadian Sergei Saratovsky, as the best in the comptetion, will win the $5000 Best performance for a Canadian. There are still prizes to be awarded - The Joseph Rouleau Award, the Best Interpretation of the Imposed Piece (Fast Forward by Alexina Louie), and the People's choice Award. I will hazard a guess - a strong candidate for the People's Choice Award may well be Alexandre Moutouzkine. We will find out on Thursday, during the Gala Concert. Stay tuned!